Alright! This week was very productive, now that I am *actually* reviewing what I’ve been doing rather than basking in the very real, very fresh frustration of my first genetic genealogy puzzle. I will definitely be writing about this sometime soon, by the way. It is extremely interesting and I think it will help others to learn. Narození a smrt translation – I really enjoy translating this book with my friend Tom. This week, Petr started to join us too, which was also refreshing! There’s a couple specific grammar things which I need to find an answer to, for example: when you use a Czech word in the English translation for clarity’s sake, but it needs to be made a plural, and the way that you pluralize words in Czech is not the same kind of construction that you would use in English (you don’t add -s or -es), how do you handle this? I’ve mostly just been avoiding this, rearranging the sentence so that we don’t run into this problem. But it is a bit inevitable sometimes. This week it came up while talking about vampires and traditional folk beliefs in them. I felt a little bit vindicated when Měchura turned out to be one of the words for vampire, because that is also the surname for a cold case for a village of origin which I was utterly unable to solve, which may be the only genealogy problem more frustrating than the DNA case I’m working on. 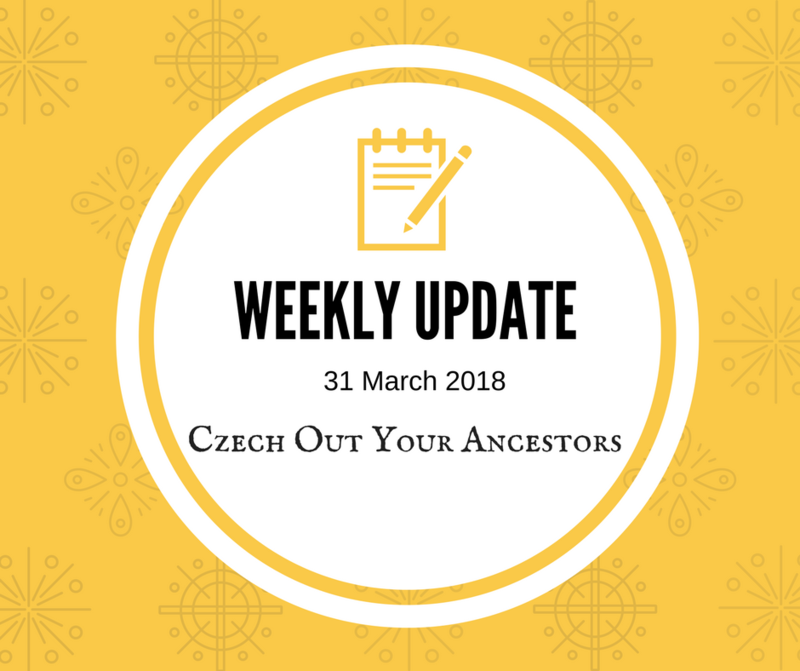 Czech Genealogy for English Speakers – I didn’t work on my book that much this week. Maybe I wrote maximum 100 words or so. I was too sucked into figuring out who this 500 cM match to my dad is. “Grundbucherbuch” – I didn’t work on this book I’m co-authoring with Lukáš very much this week, but he worked on it quite a lot. He also suggested that maybe I could present on some of the stuff we are writing about at the CGSI Conference in Lincoln in 2019. Together I brainstormed some ideas with him for a while. “My role” – Well, I got back from Minnesota about two hours ago. I drove up there on Friday night, spent the night at a hotel near to the Minnesota Genealogical Society, and then spent all day Saturday talking with and collaborating with some of the most fantastic group of people I have ever met. I really, really enjoy being a part of this group of CGSI people. I think that at the end of the day, since we didn’t get a lot officially decided or planned, some of my colleagues felt a little bit disappointed in our meeting. The truth is, it was invaluable to me. First of all, just to meet everyone in person was huge. I had already met several of them, and I’ve been meeting with them over videochat. But having a real human connection was not only just fun, it was also valuable for me as the marketing chair. It gives me a sense of what the dynamics are, who does what, who can do what, who I can ask for help, how I might approach a certain person with comments and questions, and basically – just how I can work with these people. I heard a lot of fantastic ideas for marketing and moving forward, and I feel good about the future and what I can do. I also feel satisfied that I have thoroughly convinced our team about some specific changes which I think would be really beneficial, for example with getting our website organized more intuitively. CGSI Facebook Page posts – I was kind of a slacker this week. I didn’t do a great job. But there are about 15 drafts on the back burner waiting to be scheduled and posted. And I did share at least 2. So that’s something. The Quarterly Program – So…I wrote a chapter about “How to Find your Czech Village of Origin” and said to myself, why not present this at the quarterly meeting? I submitted my proposal, they agreed, but reminded me to include Slovak villages of origin in the presentation as well. On a related note, for the first time in my life I saw the label “Silesia” as a place where the parents were born on a US census. That was kind of cool. I will definitely need to spend some time crafting a great presentation. The Symposium – I haven’t submitted my proposals for the Symposium yet. I will have a newborn at that time, though. I’m not sure if it’s great timing for me to be presenting. Though all of my colleagues today did joke about me doing a webinar during labor. Hahaha. But I did convince a few of my Czech friends to submit a proposal to present on genetic genealogy. So that will be interesting. The Conference – There will be this big conference in Lincoln, and I am definitely interesting in presenting there. I bounced ideas off both Lukáš and Jerry, who rated them in order of best to worst in terms of interest. Now I need to get cracking on writing the ideas down in coherent sentences. I am not sure how many I will end up submitting, but it will probably be several. I would love to present at this conference. Czech and Slovak Gazetteer – Discussed this with Kevin and Jerry. This has to happen. Kevin found some of the original ca 1827 sources for Hosák. So that is exciting. I am going to discuss with my husband if this project is something that could involve machine learning. I mean…it is mostly not data input, but rather checking data against itself to see if it’s correctly categorized. It’s very likely a computer would do it with fewer errors than we would. Genetic Genealogy – so…this is where I focused almost all my efforts this week. It was a little bit exhausting both intellectually and emotionally, to tell the truth. It’s so frustrating having 500 cM’s stare you in the face and you have literally *no idea* where they can fit in your tree. Also, for me, it means being faced with a difficult truth that somebody in my family, most likely my great great grandpa, had an affair. That is sad! I love these ancestors. They are real people. The adoptee relatives I’m meeting (THREE on this side of the family!) through this are also my family, and obviously it’s not their fault. I love them, too. It must be thousands of times more emotional for them to deal with than me, though. Cousin Collaboration – I’ve reached out to something like 30 of my Czech cousins this week who I have been meeting both through descendency research and DNA matches (“Hey! I think we are related! Want to figure out how?”). These are like, 2nd, 3rd, and 4th cousins, some here, some in the Czech Republic. Some of them are my match in terms of nerdy obsessive interest in solving a tricky puzzle, and I am nervous that we will scare away the adoptee relatives who must be going through an emotional rollercoaster. Sadly, more of them are adoptees than I expected, which Danny says is normal because adoptees probably are more likely to want to take a DNA test than the rest of the population! I am really excited to meet some of these branches of my family. But it is definitely more my cup of tea to sit alone in front of my three screens and decipher old documents. I mean…that’s relaxing. Talking to strangers who I found through something that is borderline-stalking…that’s not relaxing. It’s not unfun, though. Just new and different. Interesting software and tools – I downloaded two new programs this week which I can foresee will be quite helpful for me. Apowersoft Screen Recorder Pro (a similar freeware version of this kind of thing totally bloatwared me. Which is okay, because it gives me some good fodder with which to tease my friend Tom, who happens to work for one of the companies who bloatwared me, which made me literally laugh out loud) – this is screen recording software. My mic-headset has bit the dust (I mean…I used it almost every day for about a year, so that makes some sense. It was not an expensive piece of equipment) but fortunately the mic part is still working well, so I was able to play with this and create some screen videos for my DNA collaborating cousin. I predict I will be using this tool pretty often for my blog. It’s fun. I also finally bought Dragon NaturallySpeaking Home which was on a great sale. I played with it and learned that this is not a great tool to write while driving – you still pretty much need to see a screen in order to effectively write. Or at least you need to be looking at some kind of visual organizer/outline. I predict I will mainly use this to write my blog posts. I definitely talk a lot faster than I type, though I type pretty fast. Rather – it’s just a different cadence. When I type, very often I will erase some things. And there are fewer pauses. But when I speak, I can’t erase anything. I predict this will be great software for me to help me streamline some of my writing projects. At the very least, it allows me to do it in a different way. You have to understand, novelty is somehow really fundamentally important to my productivity. That’s why I like people so much. They are always new and interesting. Transkribus – I uploaded a set of 150 or so documents which I will try to create a training set for, to see how this works. Other than that, nothing new. Learning how to code in Python – I worked on this a little bit this week. I have to say that syntax errors are really annoying. Updating this website – BLERUGH it literally took me 2 hours of searching and testing and scrapping plugins to do this specific thing that I want to do – and then I was unsuccessful in the end, anyway. That was really frustrating. Also, the email subscriptions feature on my site is currently broken so I’m working on replacing it with a better, less annoying, more useful tool. But that takes time and effort, and it’s not very high priority in my opinion. I’m still working on some of the other behind the scenes things like improving my about me page. But the genetic genealogy took priority because I am a sprinter and I like to sprint on the fun projects, not the really tedious mind-numbingly painful projects. I mean, I love web site design and development, what. Sadly, this is the first month which I am behind in my reading of Babička. I hope to catch up this week and write a full post later. All in all, it’s been a productive week. Yup, I still love Czech genealogy.